Lifting a VW Beetle is a simple process complicated only by the limited number of points on the chassis where you can safely use a jack. Safe "jacking points" are described in the following steps. While the easiest way to lift a VW Beetle is on a hydraulic floor lift, you can use the standard VW jack, a scissors jack or even a hydraulic floor jack to lift your car for repairs, modifications or just to change a tire. Set concrete blocks before and after the back tires of the car to chock the tires. Lift the front of the car by rolling or sliding your hydraulic floor jack so that it is directly beneath the center of the bottom tube of the axle beam. Place a piece of wood between the tube and the jack, and raise the front of the car. Use jack stands to hold the car if you plan to work underneath it: raise the car far enough to slip the jack stands under the bottom tube of the axle beam, about 1 foot on either side of the jack. Lower the jack so that the weight of the car is on the jack stands. Chock the front tires with concrete blocks if you plan to lift the rear of your car, but not the front. Lift the rear of your car by putting a wood block on the lifting pad of the jack and sliding the jack under the rear of the car so that it is directly beneath the center of the bottom of the motor mount carrier--this is the metal bracket that spans the frame where the engine and transmission meet. 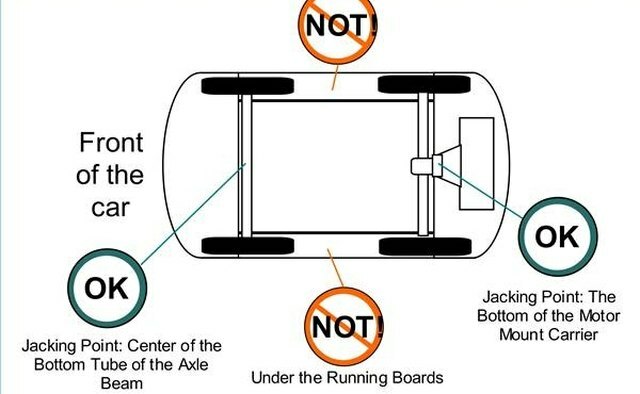 Jacking may be hampered since the movement of the jack handle will be restricted by the car. Even using a longer jack handle, the lift from each pump of the jack handle will raise the car only about 1/2", because the movement of the handle is restricted. Once you have raised the rear of the car to the desired height, set jack stands underneath the motor mount carrier about 1 foot on either side of the jack. Once again, lower the jack so that the weight of the car is on the jack stands. Do not jack your VW Beetle using the jacking points recommended in the Owner's Manual; frequently, these are among the first places for rust to form on the vehicle's undercarriage, and you won't realize they have rusted through until your Beetle comes crashing down on your jack. Never try to jack the sides of the VW Beetle up by placing the jack under the running boards; they will buckle under the weight of the car. A two-ton hydraulic jack is recommended. When lifting either the front or the back of the car, chock both of the tires on the end that is staying on the ground. There are no suitable jacking points on the front or rear bumpers of a VW Beetle. 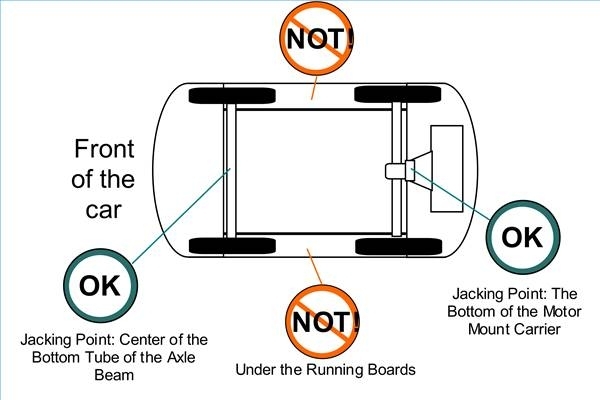 Jacks may fail or tip over, with potentially fatal consequences; do not attempt to work on a car supported by a jack only.